2018 T20 Blast Finals Day: Who are favourites and who will win the mascot race? bbc.comAnd so we usher in another T20 Blast Finals Day, the 16th in the competition's history, and another showpiece at Edgbaston awaits.Worcestershire Rapids take on Lancashire Lightning in the first semi-final, while Sussex Sharks later face Somerset.Lancashire, Somerset and Sussex have all won it before, whereas Worcestershire will be making their first Finals Day appearance. England duo Alex Hartley and Kate Cross, along with Nottinghamshire captain and 2017 T20 Blast winner Steven Mullaney, have been giving BBC Sport their thoughts before the competition's showpiece in Birmingham.The trio will all be in commentating for BBC Radio 5 live sports extra on Saturday, as will England's all-time leading Test wicket-taker James Anderson. Sussex's Jofra Archer also played in the Indian Premier League for Rajasthan Royals this yearKate Cross: I genuinely think Lancashire will win the first semi-final. In the second semi-final, I think Sussex will win.The type of cricket Lancashire have been playing is good and they've peaked at the right time in the tournament. They will have Liam Livingstone back and they're on a good run.With Sussex, the likes of Jofra Archer have the ability to change the game. I watched quite a lot of the Big Bash League over the winter and I saw how he affected the Hobart Hurricanes. If he has a good game, Sussex could win from anywhere. Which batsman should we be looking out for? SM: For Lancashire, Jos Buttler is a world class player and in the form of his life. Alex Davies has also had an unbelievable year and there's the experience of Keaton Jennings which paid dividends in the quarter-finals.Sussex's Laurie Evans has had a fantastic tournament, he's just been picked up in the Afghan Premier League and quite rightly so. One of the things Somerset have done so well is that Lewis Gregory, down the bottom of the order, has scored quickly and consistently.At Worcestershire, Callum Ferguson will be a big miss so I think there's a lot of pressure on Moeen Ali, but Ross Whiteley always comes to the party in big games.AH: Jos Buttler's going to showcase what he can do. He's played two games for Lancashire and not done anything so he'll be a highly frustrated cricket player. Liam Livingstone is back from injury and we all know how explosive he can be.They are the obvious ones but are two players have haven't played much cricket recently so they're going to want to do well. 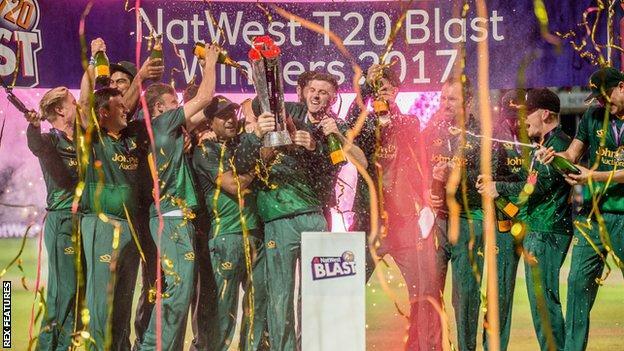 Liam Livingstone was part of the Lancashire team which won the T20 Blast in 2015KC: Definitely Liam Livingstone. With him having a broken thumb and coming back in, I feel he thinks he has a lot to prove, especially with the form he was in going into the tournament.Alex Davies as well - he's been the rock Lancashire have needed.Delray Rawlins for Sussex is class. I saw him play for the first time at Durham in the quarter-final and I was commentating. He brings so much flair to the tournament. What's the best thing about Finals Day? Who will win the mascot race? The 2017 mascot race was won by Gloucestershire mascot Alfred the Gorilla for the second year in a rowSM: I'll have to go with [Notts mascot] Nuts the Squirrel. He's looking in good form. I've seen him in the warm-ups in our T20 matches at Trent Bridge and he looks in good nick. He's not let many people beat him in those races.AH: It won't be [Lancashire mascot] Lanky Giraffe because his head is too heavy! I'm going to go with Somerset's mascot [Stumpy].KC: It won't be Lanky Giraffe. I've worn the costume before and it's way too heavy to run fast.I've got a theory about the mascot race. It's the mascots that have proper footwear on. [Yorkshire mascot] Vinny the Viking gets to wear football boots which obviously is a massive advantage, whereas Lanky has these massive things that go over your trainers so they're really hard to run in. I'm going to go with Vinny the Viking.Steven Mullaney, Alex Hartley and Kate Cross were speaking to BBC Sport's Jay Freeman.